It is well-established that the community of organisms inside our bodies perform vital roles in digestion, production of critical metabolites, controlling the immune system and even affecting the brain. To further understand these associations linking the microbiome – bacteria, yeasts, fungi, viruses and protozoans – with inflammation and disease, the University of Louisville has received an $11.2 million federal grant over five years to establish an interdisciplinary research program. The grant, awarded through the National Institute of General Medical Sciences, establishes a Center of Biomedical Research Excellence (COBRE) and pairs well-funded scientists with junior faculty in the Schools of Dentistry, Medicine and Engineering. This arrangement facilitates the career development of junior faculty, and aims to advance the study of the interface between microbiome, inflammation and disease development. "Although the microbiome contributes to many beneficial aspects of our physiology, when these communities are out of balance, or dysbiotic, they are implicated in an array of diseases such as inflammatory bowel disease, periodontitis, vaginosis, colorectal cancer, and distant sites like rheumatoid arthritis, even neurological disorders like Parkinson's disease and autism spectrum," said Richard Lamont, Ph.D., chair of the School of Dentistry's Department of Oral Immunology and Infectious Diseases and principal investigator for the grant. Furthermore, Lamont said, inflammation is a process that provides the mechanism connecting the microbiome and disease. "The interplay of the pro and anti-inflammatory components of the immune system with microbes often dictates whether a person remains healthy or develops a disease, as well as controls aspects of recovery, chronic infection and the level of tissue destruction," he said. Microbiology and Immunology in the School of Medicine is the other primary department participating in the COBRE. Researchers in the J.B. Speed School of Engineering's bioengineering department will provide expertise as possible new discoveries show potential for new therapeutic technology against disease. 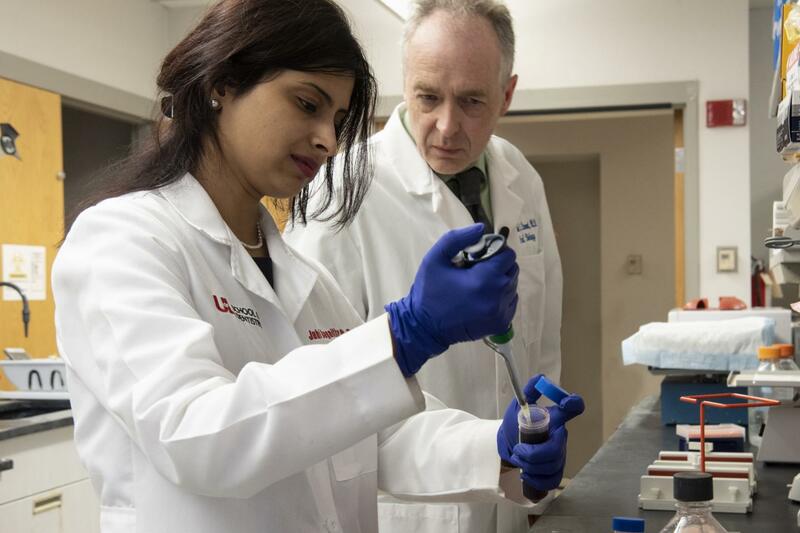 "This program will synergize with, and augment, existing research priorities at UofL centered around microbial community-associated diseases," said Greg Postel, M.D., interim UofL president. "We are confident that establishing a critical mass of investigators with unique complementary expertise will propel UofL to a position of preeminence in this important field." "We are thrilled to add this COBRE multidisciplinary program in research, education and mentoring to facilitate and accelerate the transition of junior faculty to independent extramural funded status, advancing our overall research enterprise," said T. Gerard Bradley, B.D.S., M.S., Dr.Med.Dent., dean of the School of Dentistry. Juhi Bagaitkar, Ph.D., will study how oxidants change neutrophil, or white blood cell, responses in the mouth. She is focused on inflammatory pathways regulated by Reactive Oxygen Species essential in host responses to oral bacteria. She hopes to provide insights into neutrophil biology, and enhance the understanding of immune pathways related to inflammation of the gums and the interface with microbes. Venkatakrishna Jala, Ph.D., will investigate the beneficial effects of the microbial metabolite, uronlithin A (UroA) and its structural analogue UAS03 in inflammatory bowel disorders. He will examine their impact on both immune responses and maintenance of the epithelial barrier in the gastrointestinal mucosal membrane. Matthew Lawrenz, Ph.D., will study the pathogenic mechanisms of Y. pestis, a bacterium that causes bubonic plague. Humans can become sick after being bitten by a rodent flea. Lawrenz will further investigate several mechanisms, including how Y. pestis evades macrophages, a kind of white blood cell first on the scene of infection. As the project develops, Lawrenz also hopes to explore the relationship of Y.pestis and microbial communities of the flea, which may impact colonization and transmission. Jill Steinbach-Rankins, Ph.D., will investigate a new nanotherapeutic approach to treat bacterial vaginosis (BV), a dysbiotic condition where vaginal microbial communities are disrupted. With expertise in materials science engineering and biomedical engineering, Steinbach-Rankins aims to develop targeted community engineering to restore the balance between the microbiome and host to prevent the manifestation of disease. Jonathan Warawa, Ph.D., will investigate Burkholderia pseudomallei (Bp), the bacterium responsible for respiratory melioidosis, an inflammatory disease of the lungs that progresses into a fatal systemic disease involving major organs. This project drills down into innate immune responses contributing either to protection and resolution of diseases or to increased morbidity. Through greater understanding of immune responses, therapeutic intervention is possible. The COBRE also helps establish a functional microbiomics core research facility at UofL. The facility will provide germ free animal facilities, oxygen-free culture capability, microbiome sequencing and bioinformatics, assessment of inflammatory markers and pathology services.